The Kidde Rapid Entry System is designed to help fire departments and businesses work together to preserve lives and property. It eliminates the need for fire department officials to maintain and carry cumbersome key rings with hundreds of building keys. The building owner purchases the Lock Box of their choice and mount it securely near the entrance. Fire department officials lock the building keys in the Lock Box. To ensure absolute security, Kidde has developed a flexible program for shipping lock boxes directly to building owners. Special security keys are supplied only to authorized fire department officials. When a fire alarm sounds at night or on the weekend, the fire department has instant access to the building. Access is fast, easy and safe without the need for the building owner or tenant to drive to the site after hours. Safe and secure. 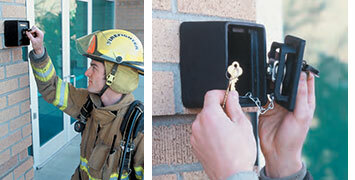 Keys that open the SupraSafe line of Lock Boxes are provided exclusively by Kidde. Our SupraSafe 2 High Security units are UL certified antitheft devices. All SupraSafes are steel construction with locking systems designed to withstand attack. Optional tamper switches can be integrated with a building’s alarm system. The SupraSafe line by Kidde offers a variety of sizes, styles and features. Building owners can custom-tailor a Rapid Entry System to meet their needs. Toll-free product support. You have the resources and backing of the world’s largest manufacturer of fire safety products. Help make it safer for the fire department to protect property and reduce injuries; avoid the expense of replacing a costly door or window due to unnecessary forced entry. For questions, please e-mail customer support, or call 800-654-9677 , press '5', then ext. 3048365.